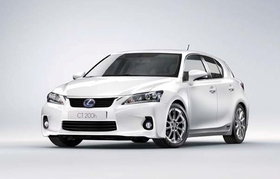 The Lexus CT 200h will challenge the BMW 1 series and Audi A3. Lexus's new CT 200h full-hybrid entry-premium hatchback will win over younger drivers due to its stylish design language, the company's European head Andy Pfeiffenberger said on Tuesday. "We anticipate that a whole new audience will respond positively to the CT 200h's dynamic styling,” the Lexus Europe chief told reporters at the Geneva auto show. “The latest evolution of Lexus -- L-Finesse design -- has given the car a real contemporary appeal to attract design-conscious, younger customers,” he added. Critics of the Lexus brand often argue that the failure of Toyota's luxury brand to attract younger drivers is one of its biggest weaknesses and the launch of the CT 200h will address that. “It is the right car at the right time. The compact premium segment became the largest in the premium market last year. The European buying public want smaller, less-polluting cars – but without any comprise on refinement and driving pleasure,” Pfeiffenberger said. The CT 200h's hybrid drivetrain is the same as the unit in the Toyota Prius. It combines a 1.8-liter gasoline engine with a electric motor. The car can run on electric power for up to 1.2 miles (nearly 2km) at speeds up to 28 mph (45 kph). Lexus says the CT 200h's exterior is styled for maximum aerodynamic efficiency and minimum wind noise. It goes into production and will rival the BMW 1 series and the Audi A3. Prices in Europe will start at about 21,000 euros (about $28,640). No release date has been set for the United States, although Pfeiffenberger hinted the CT 200h would go on sale there. “It's designed with Europe in mind, but will be sold worldwide,” he told journalists.